It must be noted these geese are “tufted” and not “crested”. A tuft is much smaller and not as pronounced as a crest. The Tufted Roman is a wonderful goose. 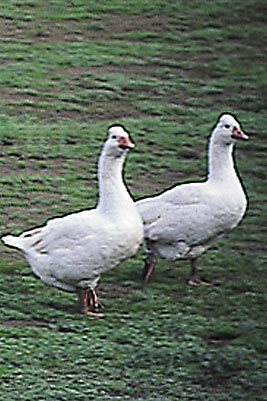 It is pure white in color with a small tuft on the top of its head. They possess a gentle temperament, lay well, and average 11-14 lbs. Quantities limited to 5 goslings per customer. How many eggs a year on average do the tufted roman lay? 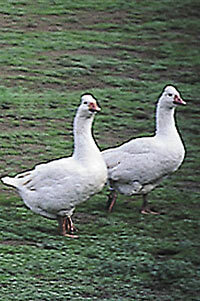 Tufted Roman geese lay an estimated average of 20-30 eggs/yr. I am ordering 11 ducks. Could I add just 2 geese to this order? Linda, yes ducks and geese are the only species that we can ship together. So yes you may add the geese to your duck order. Yes, the ducks and geese can be combined and shipped together.